June 20, 2016 By Allyson 9 Comments This post may contain affiliate links. Read my disclosure policy. 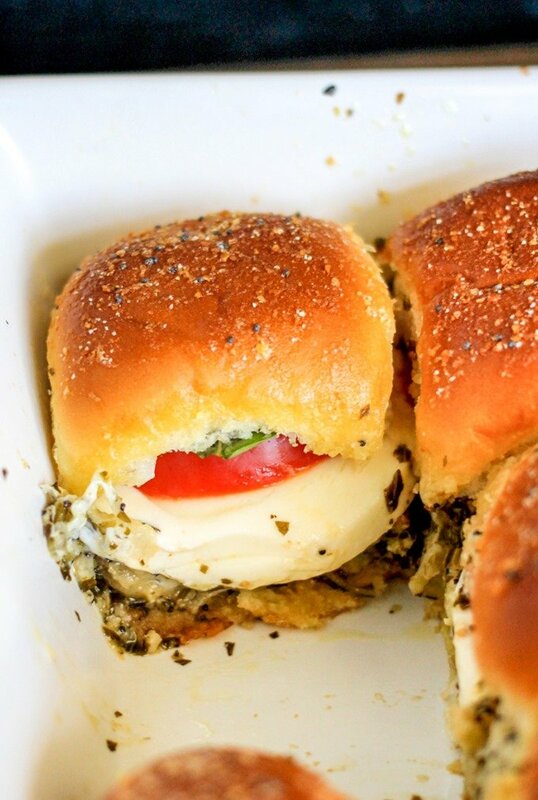 Caprese Sliders with Baked Tomato, Mozzarella, Basil Leaves & Pesto are the perfect party food! Fresh and super delicious! Over the last few weeks I have been playing with different slider recipes! It is so fun coming up with different ideas, and when I got my hands on a ball of fresh Stella Mozzarella Cheese, I had a great idea for it right away! Today’s post is sponsored by Stella® cheeses, but my love for their Fresh Mozzarella is all my own! 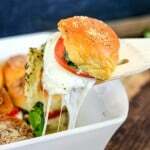 These Caprese Sliders come together in a few easy steps (see recipe video below), have delicious fresh ingredients, and are majorly delicious! 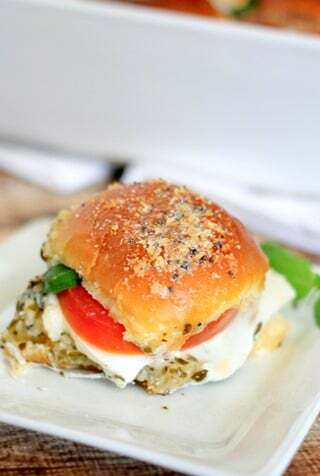 Whip up these Caprese Sliders for your next party and EVERYONE will thank you, trust me. See the cheese? Yeah, that Stella Fresh Mozzarella is the best! So smooth and creamy, and I love love love the taste of fresh mozzarella. Stella cheeses date back to 1923, so they really have the delicious soft creamy flavor down! Anyway, like I said, you only need a few ingredients – rolls, pesto, basil leaves, tomatoes, Stella Mozzarella, and butter…that’s pretty much it! How simple, right? 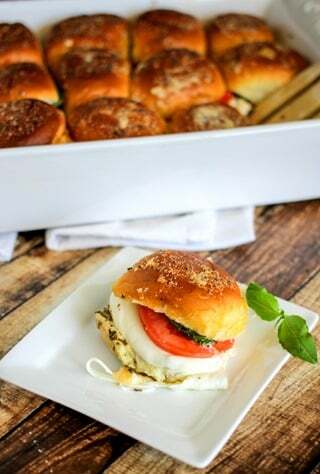 I will say, if you are making these Caprese Sliders for a party, prep all your ingredients, then set them aside until right before or during the party. This is the kind of dish you could make as people hang out in the kitchen with you. Takes about 2 minutes to throw together, then about 15 minutes to bake – so quick and easy. Pile all the ingredients together, bake, let sit for a minute, BOOM DONE! The tops and bottoms of these get nice and toasted from the cheese/butter drizzle, and it makes it perfect for picking them up. A quick finger food, and it’s really not messy either. Love these! 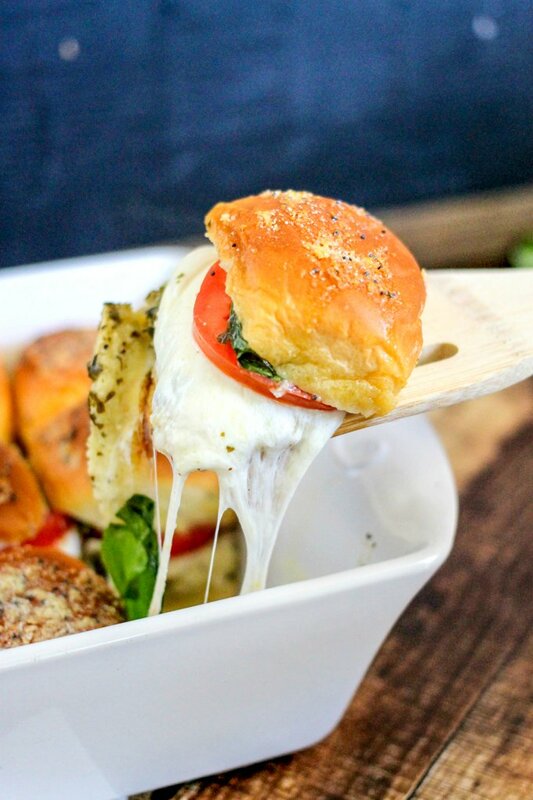 The cheese…the rolls…the basil….it’s all. so. good. YUM! Seriously so delicious. I can’t wait to dig into these again when I get home later actually. I have been thinking up more awesome slider combinations, too, so stay tuned for more slider deliciousness. Hosting a football party? 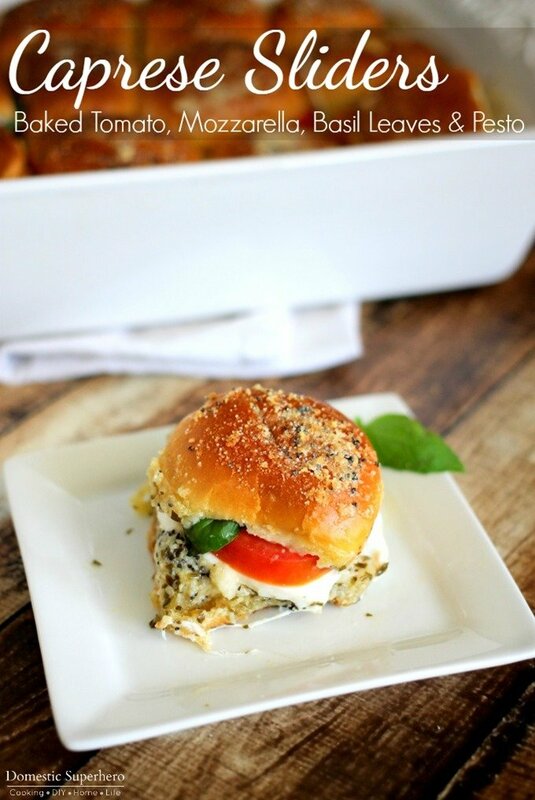 Serve these Caprese sliders as a delicious fresh snack! 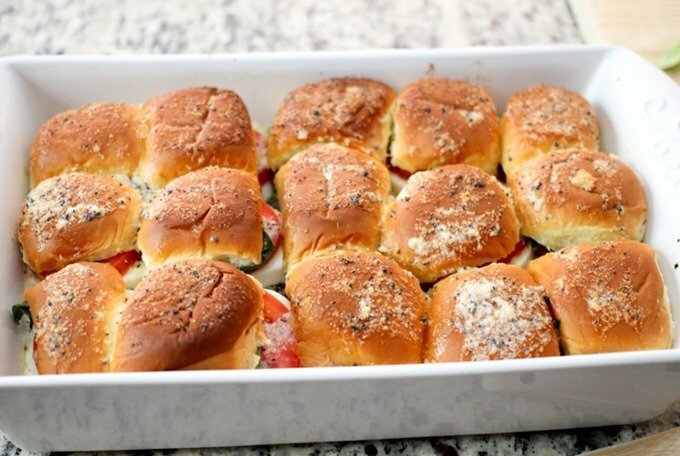 These Caprese sliders make a fantastic party food; serve them up at your next holiday party! 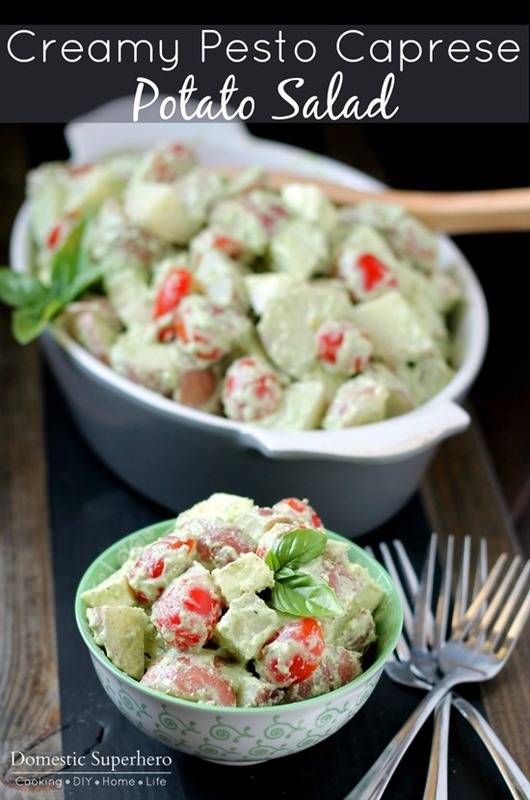 These are perfect for summer BBQ’s if you are worried about your vegetarian guests. Toss them into some foil and bake them right on the grill! Want to make these yourself? Check out the easy video below – step by step directions and super easy to make! In a large baking dish sprayed with non-stick spray, place the bottom halves of the rolls into the dish. Add pesto and spread it evenly over the rolls. 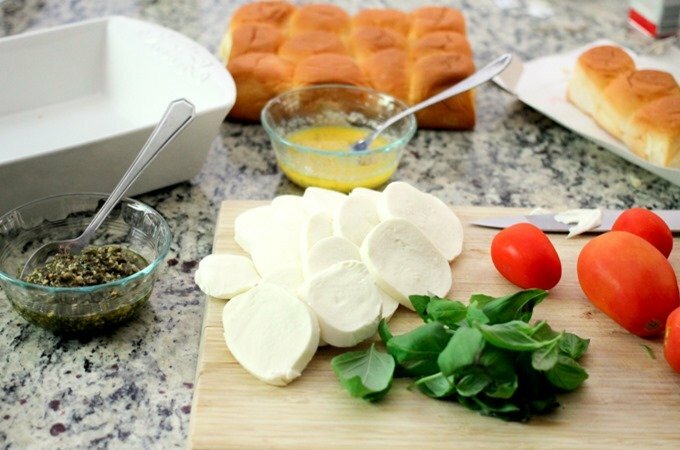 Add a slice of mozzarella to each roll (about 15), then a slice of tomato, then 1-2 basil leaves depending on size. Place the tops of the rolls on top. In a small bowl combine melted butter, Parmesan cheese, salt, pepper, and poppy seeds, mix with a fork or whisk to combine. Drizzle over the tops of the rolls, using a brush or back of spoon to distribute. Cover the baking dish with foil, then place into oven. Cook for 10 minutes. Carefully remove foil and place back into oven for 3-5 minutes, or until tops are lightly toasted and you can see cheese is melted. Use a spatula to remove the sliders and serve immediately. Looks amazing! And I love the video 🙂 PS, my oldest keeps asking to watch it again. THank you so much, Sabrina! I hope your oldest liked it! You have to try these, so delicious! This was so delicious! 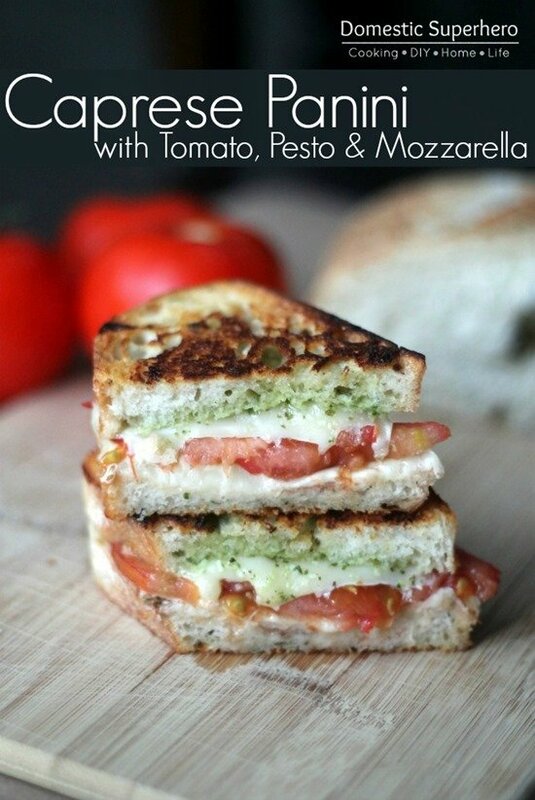 And a wonderful way to use up tomatoes from the garden! 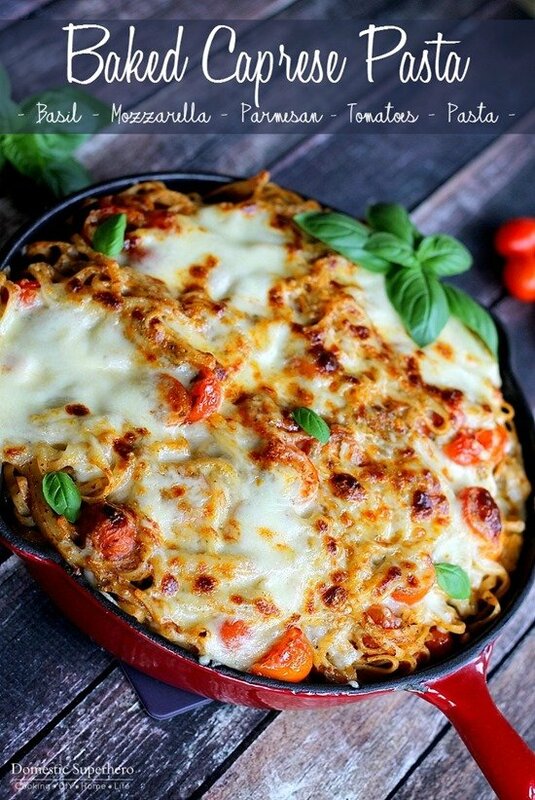 I must confess…if you aren’t vegetarian, it’s a great dish to add some rotisserie chicken to! These were also super tasty for lunch the next day! That is a great idea! I think deli turkey could also be really good! I wouldn’t. I find slider buns tend to get soggy if left made for a while. You could prepare all the ingredients the day before and then assemble and cook when needed. Sliders are TOO good!!! Sounds like a great lunch!